for using Word Styles efficiently. Innovative use of Word Styles to hide spelling mistakes which are special words – like names or technical jargon, which default dictionary does not understand. How to cross-reference specific areas within the Word document using Styles and Bookmarks. Use Styles to create easy formatting for eBook publishing. Use styles in Word and automatically create a presentation in PowerPoint. Sounds like there is no connection MS Word and SEO (Search Engine Optimization). But there is. One of the parameters which is important while performing SEO is the ease of reading of the web content. Easier the better. But how do you know if your text is easier to read or not? That is a feature MS Word has been providing for over 2 decades. And mind you, if you want your web pages to be more readable, why not treat our documents the same way? Think about it. Many SEO tools have a built-in method for checking the ease of reading. I use the Yoast SEO tool. It uses the Flesch Reading Ease score. If the score is above 65, your content is easy to read. Max score is 100. So what about MS Word and SEO? Many of us highlight important portions of documents while reading in Word. The question is, next time you refer to the document, how to read the highlighted portions only? Most people have not even attempted to find the answer to this question. They just scroll and scroll … defeating the purpose of highlighting! The solution is simple. Press CTRL G and click the Find tab. Click More – open the Formatting dropdown. Choose Highlight. Now the Find textbox shows that highlighted text will be searched. Click on Find. Now press Escape button to close the find dialog. Read the highlighted area. Now to find the next area just press CTRL PgDn button. Is this not easy and elegant? Now, let us go one step further. What if you want to send only the highlighted content to someone? This is like selecting all the highlighted portions in one go. That is also easy. Instead of choosing the Find button, click the Find In – Main Document option. Now close the Find dialog. All the highlighted portions are now selected. Press CTRL C to copy and then paste it into another document. That’s it. 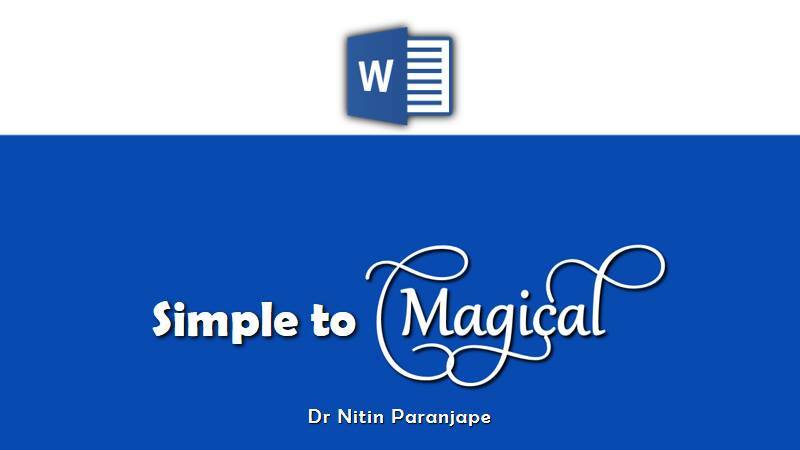 Word provides two features for reusing the effort you have put in creating content. Word Templates are useful for creating an entire document from an existing one. Building blocks are useful for reusing parts of the document like common text, custom tables, headers, footers, textboxes, etc. In this article we will see how to save a document as a template. It is very simple really – Choose File – Save As and select Word Template (.DOTX) option. To learn more, read these related articles. For a more in-depth coverage, watch this 30 min Word Best Practices video. I want to select a sentence. Sometimes, instead of the sentence, the entire paragraph is selected. Inside a table, contents of the entire cell are selected. I quickly undo and then try to select the text again, this time with a bit more caution, but alas, the problem still remains. It is inexplicable and frustrating. Here is what you do in such cases. I want to select the second paragraph. I am using Shift Right Arrow to select the text, one character at a time. Usually we get frustrated at this point. We give up the effort and start all over again … HOPING that it will work this time. It never does! Fortunately, there is a simple solution to this selection nightmare. The solution is … Press SHIFT and LEFT ARROW once. That’s all. Even if you use Shift CTRL RightArrow to select word by word, this problem can occur. The solution is exactly the same: Press Shift LeftArrow. This is a list of articles related to this video. The video is not published on this blog.